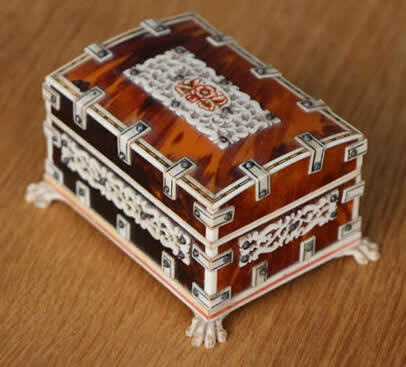 Often referred to treen the making or small ornate wooden objects for household use, these two collectable needle cases or trinket boxes are made from solid birch. One is in the shape of a lighthouse complete with enhanced lense. 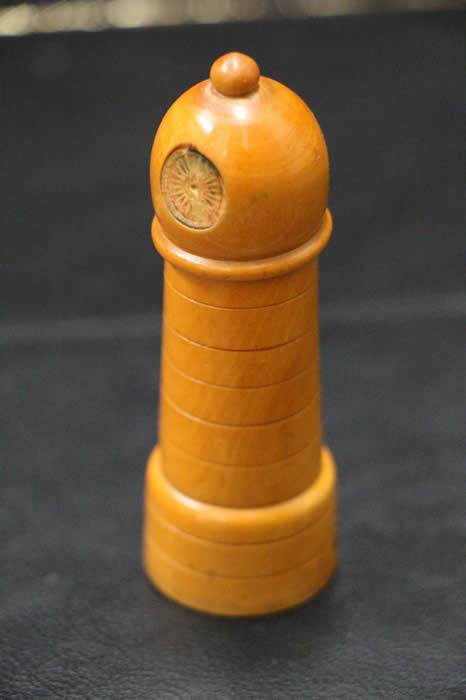 The turned top unscrews from its tapering base to reveal a hollowed out needle case inside. 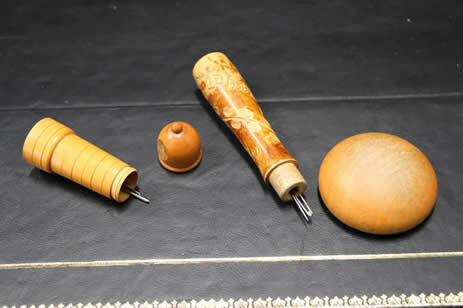 The second is in the shape of a mushroom, the top ideal as support for embroidery. 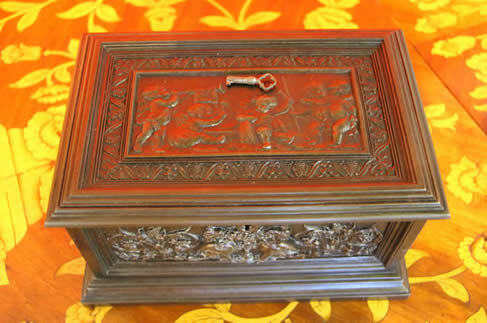 The handle is engraved with a leafy branch and the words "Himmelbjerget" or Sky Mountain. It is one of the highest geological peaks in Denmark and has been a tourist destination for centuries. 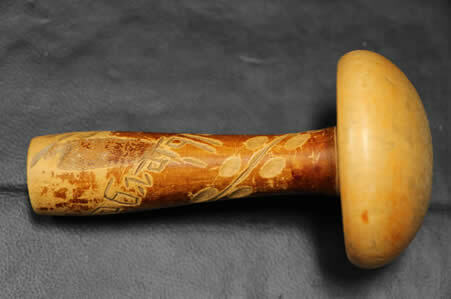 The top of the mushroom can be pulled off the base to reveal a needle case hollowed out inside. 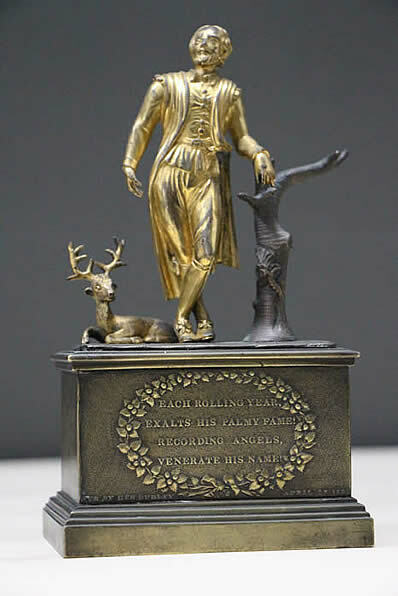 Antique cgilt ormolu and bronze statue of William Shakespeare. 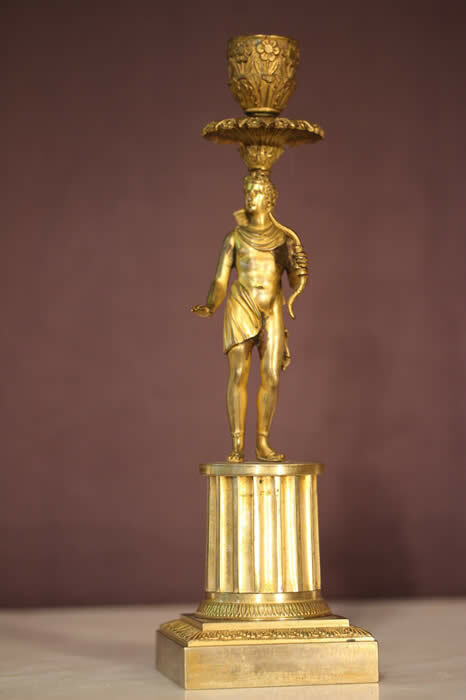 Cast and produced in commemoration and dated April 23rd 1822 by George Dudley . 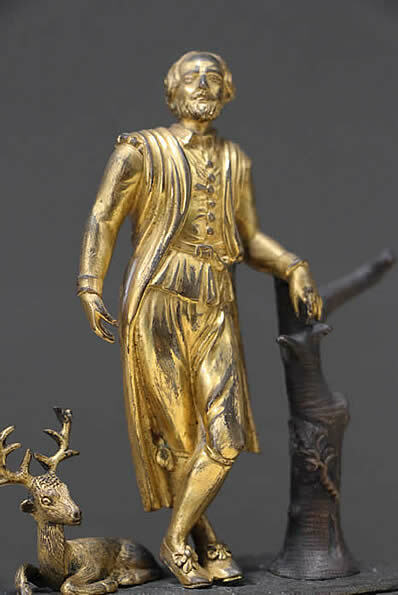 The mercurial gold gilt statue of an Elizabethan man leaning on a tree with a stag at his feet awaiting to be entertsined. "Each Rolling Year Exalys his Palmy Fame! Recording Angels venerate his name!" 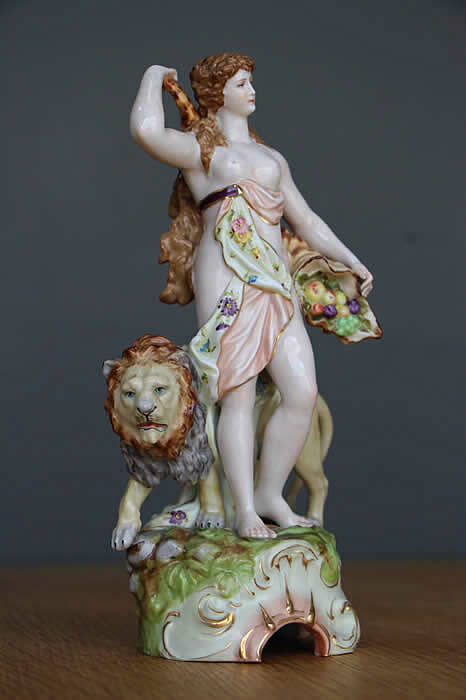 Hand painted statue goddess Dianna or Artemis accompanied by a lion. 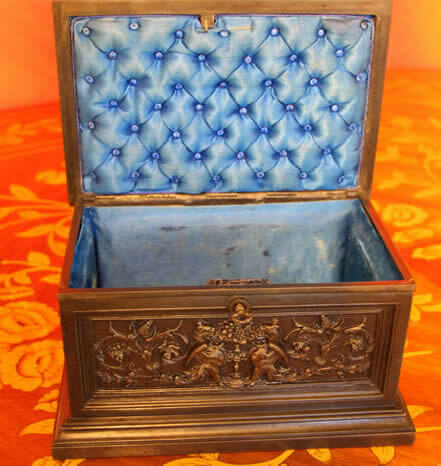 Hand painted with floral and gilt highlights . 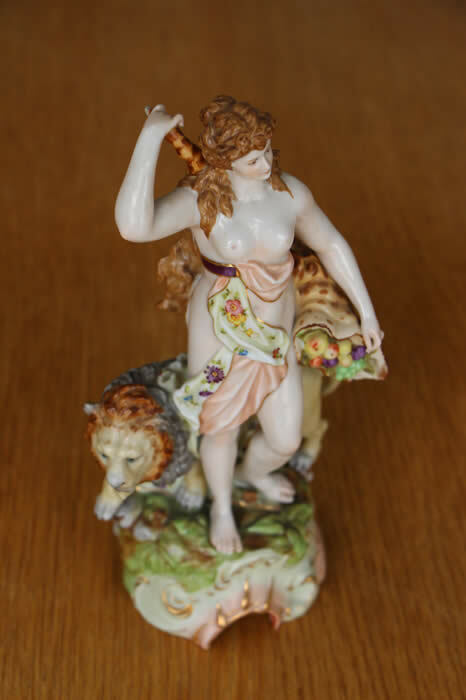 Modelled on a naturalistic rococo pedestal with gold highlights . 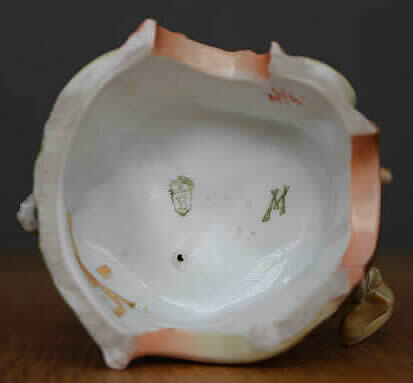 the stamp ubderneath with germanic crown with initials S V.
This stamp was used by E.&A. 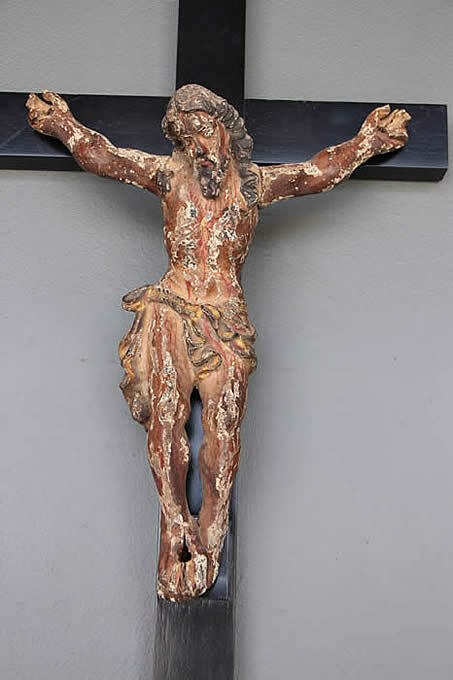 Mueller of Thueringen , Germany between the years 1890-1927. 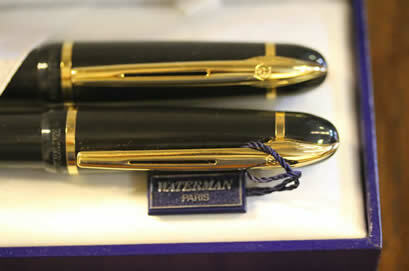 Waterman Paris : Ballpoint pen and mechanical pencil set. 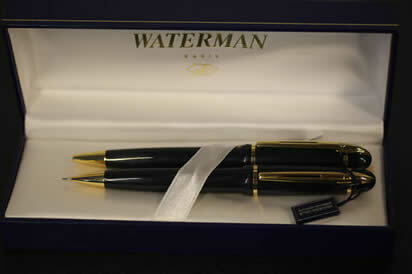 Manufacturer and Year: Waterman, France – this is the first version of the Phileas that came out in the 1990s. Solid Sterling Silver tag. 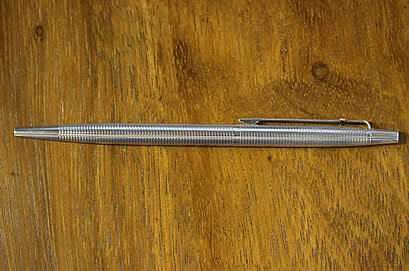 Length Both ballpoint and pencil measure 5-3/8" long when the pencil's pusher tip is retracted. Filling System The ballpoint takes Waterman ballpoint refills and a good working refill is installed. The pencil takes leads which it extends in repeating mechanism in which you twist the cap to extend the lead one click. . 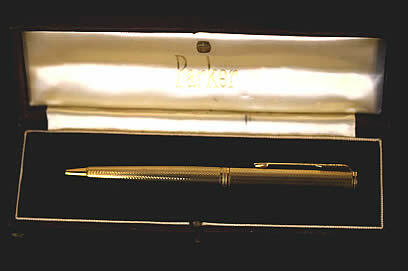 Original Vintage Parker ball point pen. 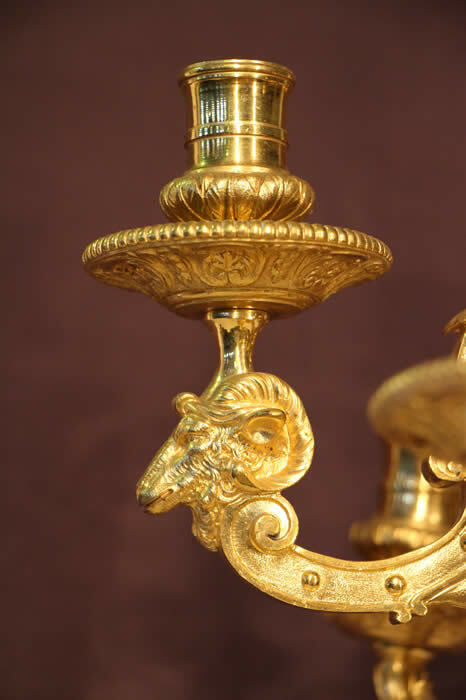 Gilt chisselled detail in bright and matt gold. 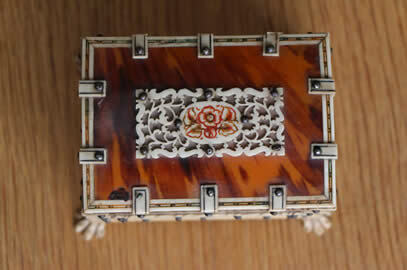 In original case and numbered P18869 Cisele . 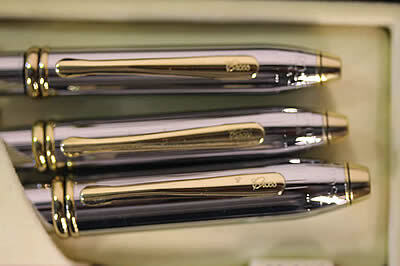 Classic Twist Action Ball Point Pen from Parker. 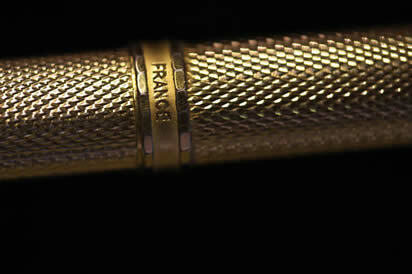 In beautiful used condition this pen is Gold Filled and marked "PARKER" and "FRANCE" on the center ring. 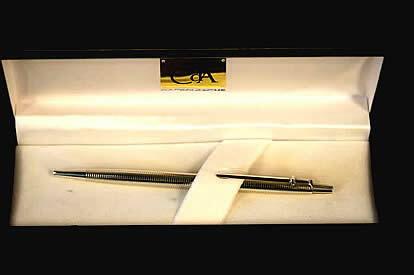 This is rare CARAN d'ACHE MADISON COLLECTION Sterling Silver 925 Ballpoint Pen. It has a twist mechanism, works well. No dents or cracks. It is totally in MINT condition. 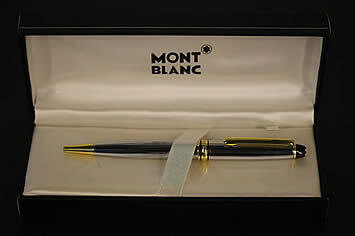 Gilt mounted and rare chrome Montblanc ballpoint pen with later box . Engraved Meisterstuck and Montblanc to gilded rings. 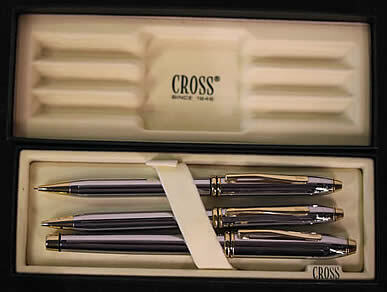 Cross Townsend Medalist trio: Fountain pen, pencil and Rollerball Pen. 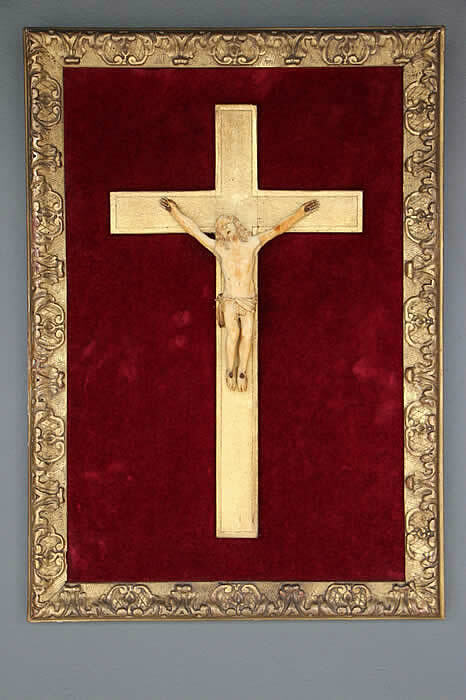 In polished Chrome and gilt mount finish. 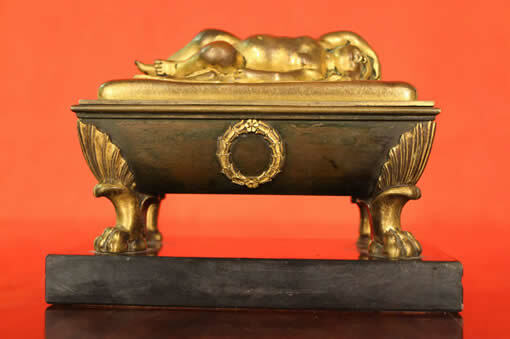 Ormolu Empire jewel casket with sleeping putto top. 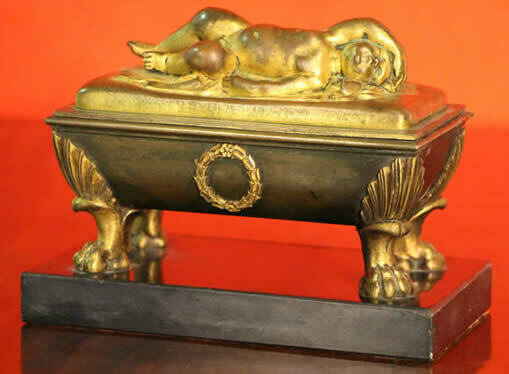 Raised on lions paw feet and gilt ormolu wreath on patinated bronze casket. 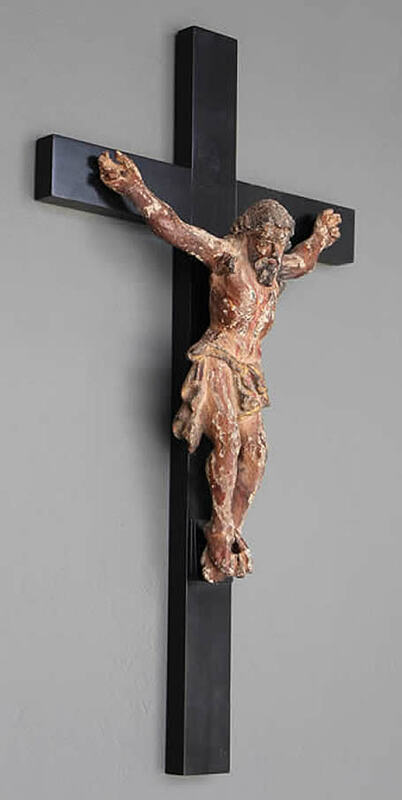 Mounted on black marble base. 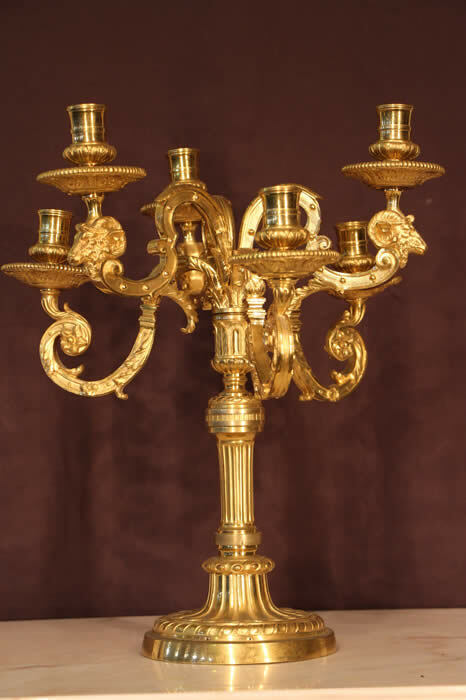 A Superb quality French ormolu candelabrum with with six arms emminating in two heights from a beautifully formed candelabra base. 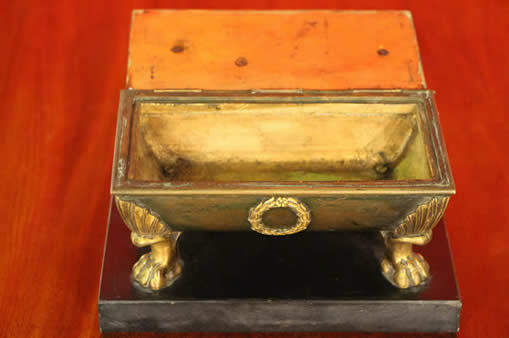 Scroll arms or solid bronze with acanthus scrollwork and rams heads supporting neoclassical acanthus adorned wax trays and original candle cups. 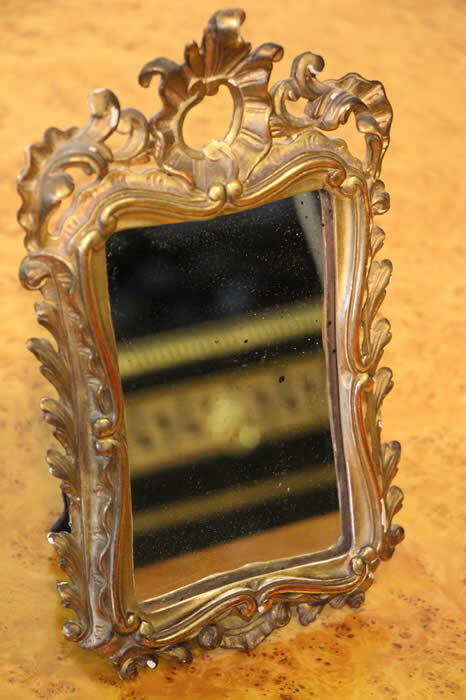 Beautifully carved watergilt Lousi XV table mirror with watergilt finish in real gold leaf. 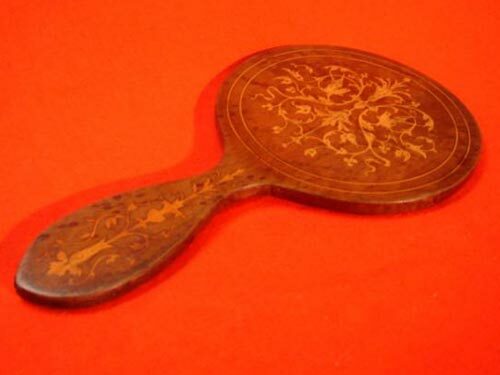 the mirror has a integrated stand or can be hung on a wall. it also retains it's original mirror glass. 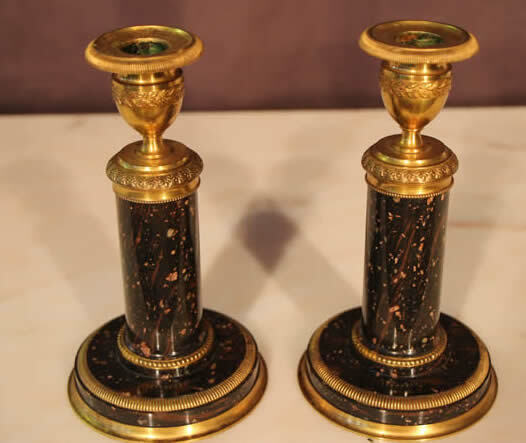 Rare pair of Swedish Porphyry candelsticks with mercurial gilt bronze mounts. 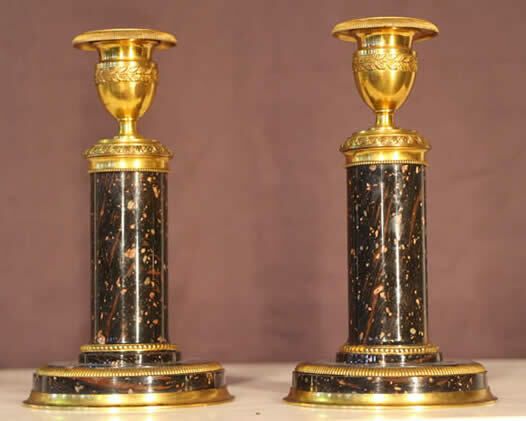 This gorgeous pair are in excellent condition and the Swedish stone is unique and faultless, no chips or repairs. 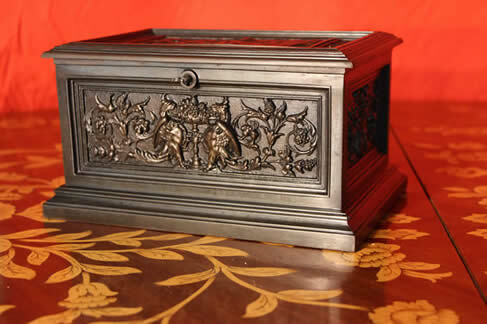 In the Empire manner, with reeded column with chisseled floral acanthus scrollwork with palmette top. 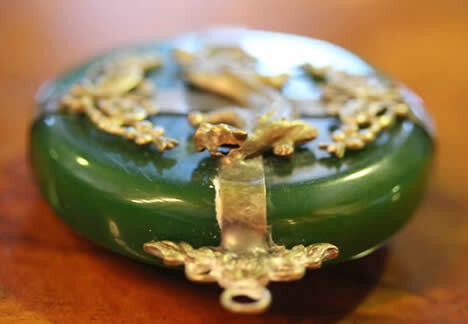 Still retain their original bronze wax drip trays / bobeche that hold the candle. Porphyry was mined in Alvdalen since 1788 . 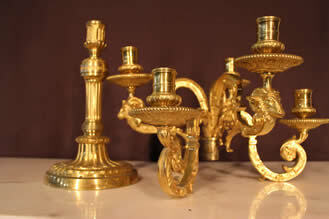 It was later aquired by the King of Sweden Karl XIV Johan, and these candelsticks would date and come from this source. A genuine George Jensen solid pewter pendant . 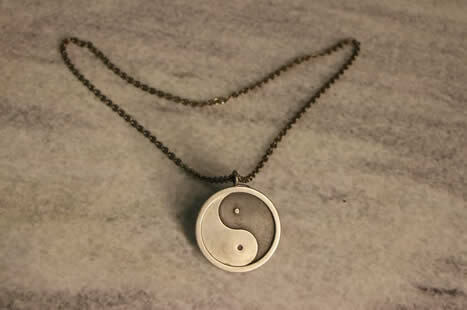 This vintage Pewter pendant design # 295 is made in Denmark signed Jorgen Jensen. 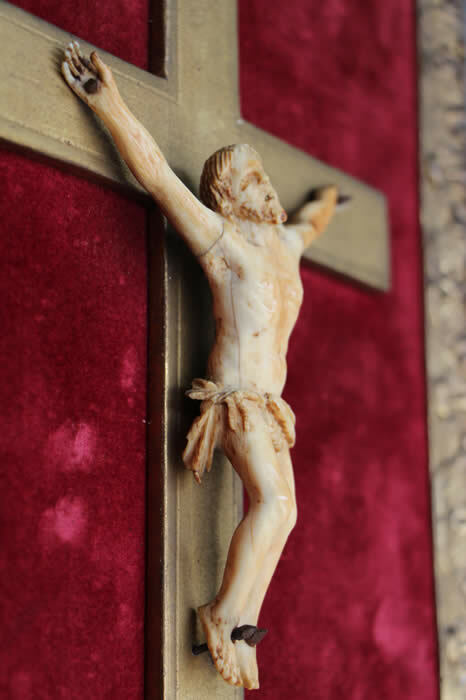 The piece is in good condition, and probably dated circa 60s. 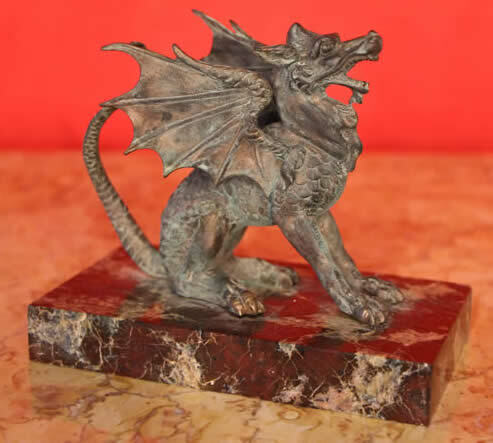 Jorgen Jensen was another well-known Danish pewter artist/craftsman. Born in 1931, the son of a realtor, he’s often mistaken for the son of silversmith Georg Jensen, who had the same name. For a short time, he worked at Georg Jensen's workshop, but moved first to Montreal then Stockholm before setting up a studio from 1960-1965 in the basement of a building his father owned in Copenhagen. 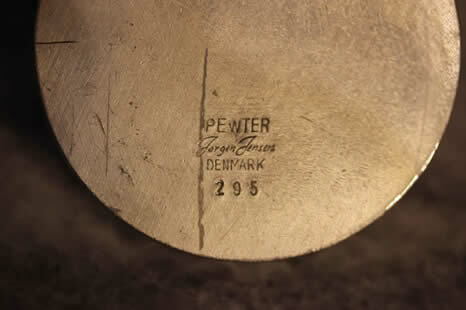 Jensen liked to work in pewter because he found it pliable and affordable. 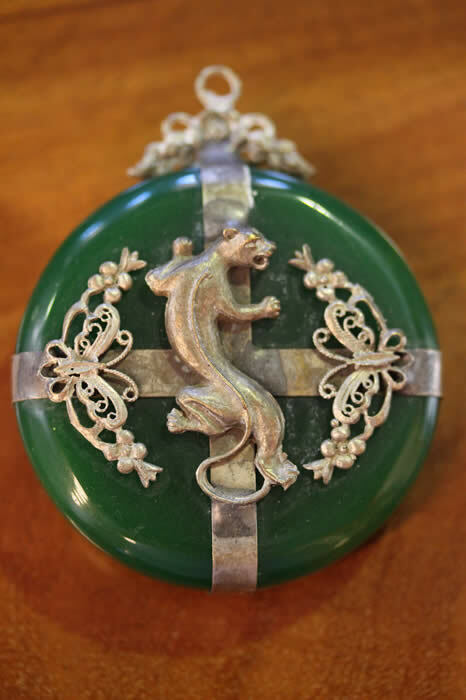 Unlike the other Jensens, he created simple, fine jewelry in pewter. 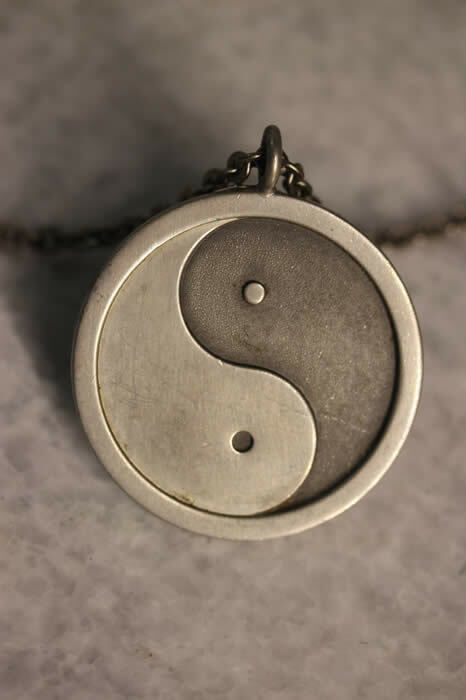 "Yin and yang can be thought of as complementary (rather than opposing) forces that interact to form a dynamic system in which the whole is greater than the assembled parts" there is a little piece of Yin in every piece of yang and vice versa. All pewter 1960s vintage including original chain. Measurements: disc width 3mm think diameter 2"
A few surface scratches and minor dings appropriate for this vintage. 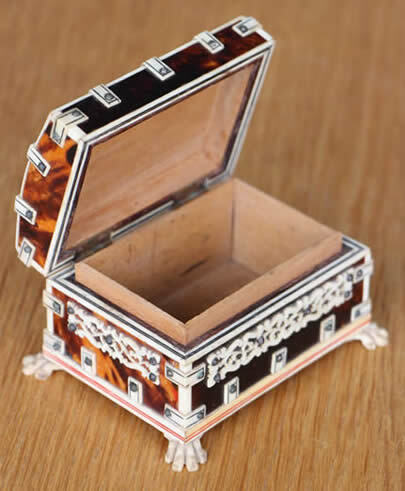 Description Louis Philippe Hand mirror with marquetry inlay in box wood on birds eye maple. 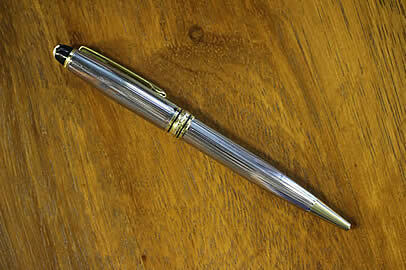 Good original pen work and patina and retains its original bevel edged mirror. First half of the 19th century France. 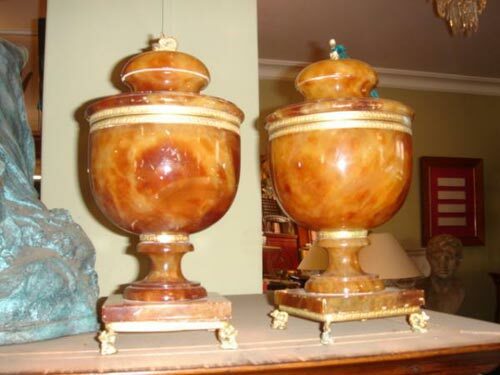 Description Rare pair of lidded Onyx urns with gilt mounts in the Italian manner. Priced per pair. 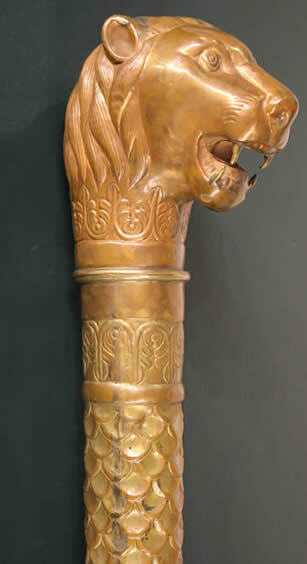 This type of mace known as a Soota or souta was usually carried by a Soota berdar as part of the regalia of a Maharaja. 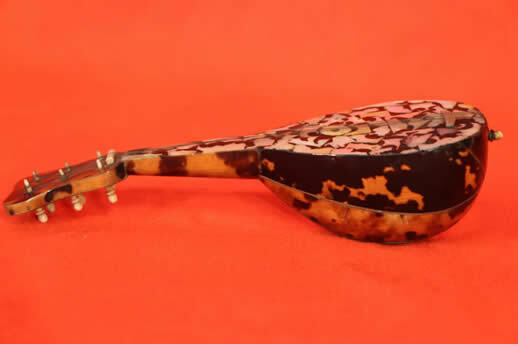 Description Tortoiseshell miniature lute with ivory and mover of pearl shell inlays and brass stringing. A wonderfully cute souvenir of the Grand Tour.